Synopsis: (Goodreads): About to turn thirty, Alice is the youngest of three daughters, and the black sheep of her family. Drawn to traveling in far-flung and often dangerous countries, she has never enjoyed the closeness with her father that her two older sisters have and has eschewed their more conventional career paths. She has left behind a failed relationship in London with the man she thought she might marry and is late to hear the news that her father is dying. She returns to the family home only just in time to say good-bye. Daniel is called many things—”tramp”, “bum”, “lost.” He hasn’t had a roof over his head for almost thirty years, but he once had a steady job and a passionate love affair with a woman he’s never forgotten. To him, the city of London has come to be like home in a way that no bricks and mortar dwelling ever was. He makes sculptures out of the objects he finds on his walks throughout the city—bits of string and scraps of paper, a child’s hair tie, and a lost earring—and experiences synesthesia, a neurological condition which causes him to see words and individual letters of the alphabet as colors. But as he approaches his sixties his health is faltering, and he is kept alive by the knowledge of one thing—that he has a daughter somewhere in the world whom he has never been able to find. 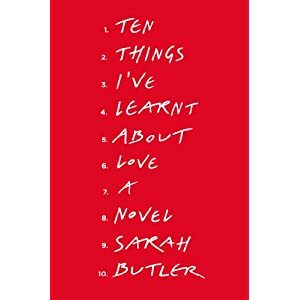 A searching and inventive debut, Ten Things I’ve Learnt About Love is a story about finding love in unexpected places, about rootlessness and homecoming, and the power of the ties that bind. It announces Sarah Butler as a major new talent for telling stories that are heart-wrenching, page-turning, and unforgettable. Personal Thoughts: This sounds like an amazing book of self discovery, finding love, homecoming and much more. I love the bright red cover and how each word stands out on its own. Upon taking a closer look at each word it is next to a number from 1-10. This sounds like it will be a thought provoking read. Once I close the book, I can tell that I will keep on thinking about it. Sarah Butler is a new author and it will be interesting to see what her writing style is all about. I have never heard of her until this book and I hope that she doesn’t disappoint. 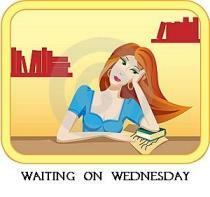 Categories: waiting on wednesday | Tags: 2013, penguin press hc, sarah butler, ten things i've learnt about love, waiting on wednesday | Permalink. Synopsis (Smashwords) :What happens when the person you love doesn’t love you back? “Burn” is a tragic tale of unrequited love, dark passion and obsession. Personal Thoughts: Wow! This was quite a dark story. The first half of the story made it seem like it was going to go one way but then it switched and became something dark and obsessive. It’s a star-crossed lovers type of novella. Penny falls for a guy, Matthew, in her junior year of university and believes that it is love at first sight. Unfortunately, he doesn’t feel the same way and she ends up moping until her senior year, before moving on with her life. Just when she is over and done with him, things start to twist in a dark way and strange things start to happen. Love and obsession go hand in hand, and sometimes it doesn’t end up as you think it will. The author did a great job in making this a fast pace novella. Right from the start I was hooked and couldn’t wait to find out what would happen next to both Penny and Matthew. There was some character development and we were able to get to know them a bit. The ending had quite a big twist that came out of nowhere and left me thinking ‘where did that come from?’ It was quite a shocker! The plot twists were entertaining in this novella and kept me on the edge of my seat. Overall it was a great, short, yet entertaining read. Categories: Book Reviews | Tags: Amanda Lawrence Auverigne, burn, library thing, love, obsession, short story | Permalink. Synopsis: (Goodreads): Getting a handle on finances can be challenging at any age. Whether you’re a parent struggling to explain savings to your children, a newly engaged couple considering joint bank accounts, or a baby boomer entering retirement, Kevin O’Leary has advice to help you make and keep more money. As a lead Dragon of CBC’s Dragons’ Den and ABC’s Shark Tank, Kevin’s success with money management and in business is legendary. But he’s made mistakes along the way, too, and he’s writing this book so others–like his son and daughter–can benefit from his experiences. Each chapter is geared to a specific age or stage in life. You’ll find real-life examples of common money mistakes (and strategies for avoiding them), “Cold Hard Truth” quizzes and charts aimed at boosting your Wallet Wisdom, and tips and tricks for making more money and growing it faster to achieve financial freedom. Personal Thoughts: I was originally asked to buy this book for someone else. However, before giving it to them first, I wanted to read it over and see what interesting tid bits Kevin O’Leary had to say on the topic of finance. There were a lot of things that I already knew, like making a budget and paying off your debts/ mortgage as soon as possible. The philosophy that was mentioned right off the top Don’t Spend Too Much. Mostly Save. Always Invest. definitely made me shift my thought process and the relationship I have with my money. Kevin O’Leary’s life stories and his witty yet blunt cold truths put things into perspective and make you realize just how much money you are spending on junk/things that you don’t really need. This book is exactly as it states; it gives you the hard facts of what needs to be done with your finances to get out of the red and into the black. I know some people will read this, find it interesting but after a few days or weeks will forget about it and move on in their daily lives. I found this book very eye opening in a lot of the topics: mortgage, marriage, young and old life situations, etc. There was no sugar-coating yet it was humorous in some parts of the book. I highly recommend this book to those that want to get a better sense of where their money is going or could be going. 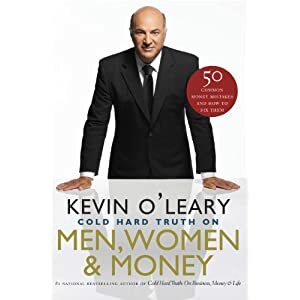 Categories: Book Reviews | Tags: cold hard truth on men, dragons den, kevin o'leary, money, women & money | Permalink. Synopsis (Smashwords) : Two sisters Heather and Sara Donavan are happily preparing for the holidays. With both of their parents gone for the afternoon to complete some shopping, the sisters are wrapping gifts, listening to music, eating treats and playing with their adorable new puppy named Daley. Soon, Heather and Sara’s holiday celebration is interrupted by the arrival of their obnoxious older brother named Oliver. Personal Thoughts: I haven’t read a short story in a long time and when I saw this on Library Thing, I thought I’d give it a try to see where it goes. It sounded entertaining as well as a fun read. I did not enjoy this short story at all. It was listed as humour, however, there weren’t that many funny parts there. I think that this story has a lot of potential, but it needs to be revised and it would be a good story. 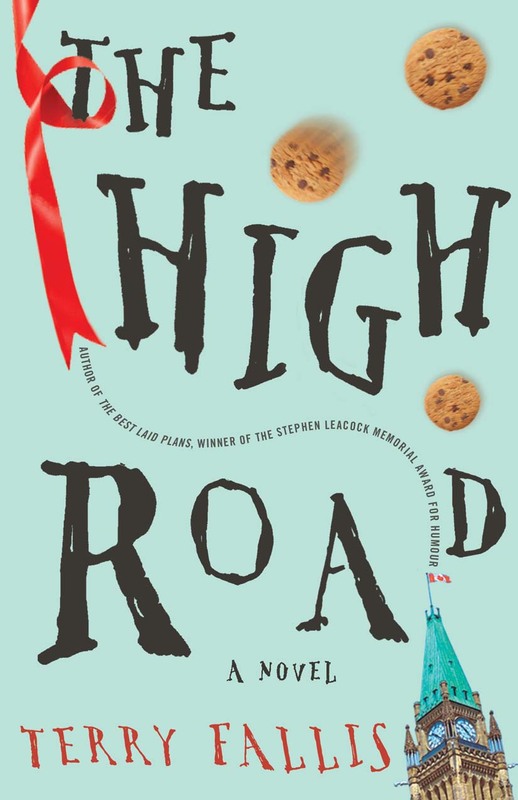 The writing style does take away from the story and it was a struggle to continue. One of the things that really bogged down the story was the descriptions at the beginning and throughout the story. It just came out as details, and not as details that added to the story to make it more interesting. The plot concept was interesting, however, there needs to be more action involved. It just seemed as though there were a lot of details and before you blinked the story was finished. The story left a lot of things unanswered and it made me, the reader, unsatisfied. Categories: Book Reviews | Tags: Amanda Lawrence Auverigne, an honest mistake, library thing | Permalink. A Boston lawyer, Eli has weathered an intense year of public scrutiny and police investigations after being accused of—but never arrested for—the murder of his soon-to-be-ex wife. Personal Thoughts: This book sounds so intriguing and interesting. There’s hints in the synopsis that there might be flashbacks or ghosts involved and that’s always fascinating to read about. It is another Nora Robert’s book and I can’t wait to get my hands on it. The cover looks awesome and a bit mysterious. You know what they say about quiet places or islands; they are the ones that have mysteries and secrets just waiting to be uncovered. In the mean time I’ll be catching up on some of my TBR titles and delving into non- ficiton a bit. 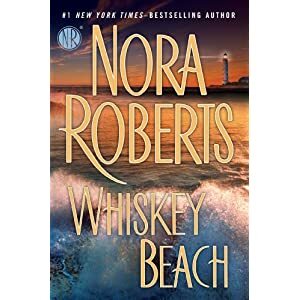 Categories: Memes, waiting on wednesday | Tags: breaking the spine, memes, nora roberts, putnam adult, waiting on wednesday, whiskey beach | Permalink. In my Mailbox is a weekly meme hosted by Kristi at The Story Siren. In this meme you showcase all the books you got that week, whether it was borrowed from the library, bought, gifted,etc. 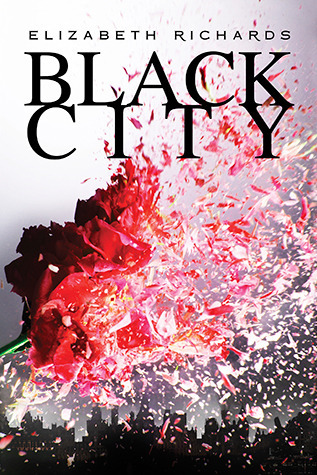 Categories: Memes | Tags: black city, elizabeth hoffman, elizabeth richards, if i tell, in my mail box, janet gurtler, kevin o'leary, literature, terry fallis, the cold hard truth about men, the dove keepers, the high road, women and money | Permalink.